To round off Official Doctor Who week, before we face off against the Daleks (won’t they ever be exterminated?) with the new Doctor tonight, I bring you a review. The wife and I have lately taken to listening audio books while on the road, which is more fun than I would have thought. Apparently listening to books can be almost as good as reading them. Of course, with the new Doctor being only a week old there are no novels out yet featuring him, so I’ll be looking at The Stone Rose the first novel featuring the Tenth (and also Eleventh and possibly Twelfth (I see this is going to get confusing…let’s stick with Tenth)) Doctor, written by Jacqueline Rayner and narrated by the Doctor himself, David Tennant. The Stone Rose begins with Mickey showing Rose and the Doctor a two-thousand year old statue in a museum of a Roman goddess that looks exactly like Rose. 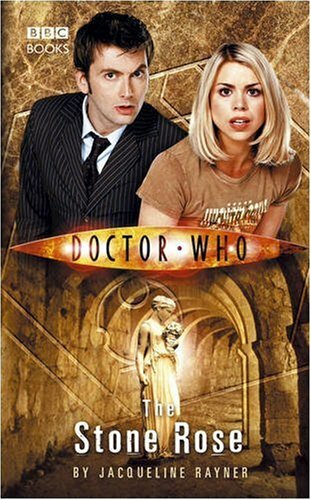 Naturally Rose and the Doctor hop into the TARDIS (this was before Mickey started travelling with them) and set off for Ancient Rome where the Doctor gets caught up in the search for a missing boy and Rose gets an early start on her modelling career, but gets a bit more than she bargained for. Guinan, the bartender aboard the Federation Starship Enterprise in Star Trek: The Next Generation, is hundreds of years old. In the episode, Yesterday’s Enterprise, she is able to sense it when the timeline changes. She met Picard five centuries before Picard meets her. And the Enterprise has holodecks which are bigger on the inside. Discuss. Finally, after eight excruciating months of waiting, the time has finally come. In a few minutes the world will meet the twelfth (thirteenth? (fourteenth??)) Doctor, this time played by Peter Capaldi. It’s amazing how the Doctor managed to infiltrate our lives since the show was revived almost a decade ago. He is fast becoming an almost mythical character. Possibly it’s the novelty of a character that constantly changes his face while remaining the same person, the paragon of re-invention. Perhaps it’s the way Doctor Who exploits that most remarkable ability of Science Fiction to use the fantastical to show us our everyday selves in a new light. Maybe it’s just that it’s so incredibly fun, taking geekdom mainstream like Star Trek and Middle Earth has never been able to do. Zinzi has a Sloth on her back, a dirty 419 scam habit and a talent for finding lost things. But when a little old lady turns up dead and the cops confiscate her last paycheque, she’s forced to take on her least favourite kind of job – missing persons. Being hired by reclusive music producer Odi Huron to find a pop star should be her ticket out of Zoo City, the festering slum where the criminal underclass and their animal companions live in the shadow of hell’s undertow.